Cynthia was very surprised, and shocked. She expected John to get extremely upset, but she didn't expect that once he got what he wanted off his chest, he was very forgiving. She thought that he will never forgive her. But maybe after hearing her explanation, he understood it better, maybe that's why he was forgiving towards her. She sighed of relief while laying in John's arms. Both jumped when they heard a door crack. They both turned and found Neil poking out his head, "Is it safe to come out?" John laughed and told him that it's safe to come out. Neil opened the door wider and Julian flew out and landed in Cynthia's open arms. "Julian, I would like you to meet someone special to me, and to you," Cynthia said, "I would like you to meet your father, his name is John, but you call him daddy." "Hi Daddy," Julian whispered, trying to hide his shy face into his mother's chest. "Hi Julian, I've been waiting for so long to meet you," John leaned toward Cynthia's chest where Julian's head was hiding, nuzzling his chin on Julian's little shoulders, hoping that Julian will become warm to him. "Oh, Julian, don't be shy, we will be with him for a loooong time!" Cynthia tried to comfort Julian. Suddenly, Julian lifted up his head and looked straight into John's eyes. They stared at each other what seemed like eternity, digging into each other's young souls. John felt touched to know that Cynthia named Julian, ironically, same as the dream that he had, John Charles Julian. When John informed to Cynthia that he dreamt about her giving birth and naming him the same exact name, Cynthia was stunned, not upset stunned, but a happy stunned. They started to laugh and commented on how they are truly perfect of each other. Then, after a few more minutes, suddenly another door cracked, Neil, Julian, John, and Cynthia turned and found Paul, George, and Mal poking their heads out and asked if it's safe to come out. John invited them back out to the main living room. John looked at Cynthia and decided that it was time to make an announcement. "Beatles and germs," he started, "I would like to make an announcement," Brian, George, Paul, Neil, Mal, and Ringo became quiet, Cynthia still sat on the sofa with Julian, knowing what the announcement was about. "I am pleased to announce that Cynthia and I will be getting married after all, and this time, she is not going to get away!" The room chuckled, except for Brian, who started to sulk and complain, "But a Beatle mustn't get married! It's bad for the group's image!" "Oh shut up Brian, you are just saying that because you're in love with him," said Paul. "No, I'm not!" Brian protested. 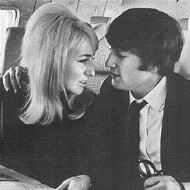 "Yes, yes you are, when Cynthia left, you practically threw a party to celebrate the fact that John's single," George said. John and Cynthia looked at each other, a bit startled, but they knew quietly that Brian had a crush on John. George, Paul, and Brian kept throwing insulting facts one another until John had enough and demanded that they be quiet and made everything clear, "Cynthia and I are getting married, tonight, and there's nothing you can do about it!" looking straight into Brian's eyes. But after he said that, the room gasped. Married tonight? Cynthia looked surprised, she was not expecting this at all! John realized what he said and turned to Cynthia and he fell on his knees. "Yes Cyn, I said tonight, because I love you so much and I want you to be at my side for all eternity and I can't wait to go back to England to get married. I want you to be my wife, now." John looked deeply into Cynthia's eyes, hoping that she won't bolt out the door with Julian and never be seen again. Cynthia looked into John's eyes, seeing that he's serious and decided Oh, what the hell? "Okay, let's get married!" Cynthia stood up and headed for the door, with Julian in her arms, but she stopped suddenly. "What's wrong?" John asked in concern. "Wait a minute, am I going to wear this on the biggest day of my life?" Cynthia said, pointed down at her outfit, which is not really a great outfit to get married in. "You're right, well, maybe we can find a nice store with a pretty dress for you and you could put it on in the car!" John said. John turned to Brian, Ringo, Paul, Mal, Neil, and George, "Neil, you find us a car and drive, and Paul, you're the best man. George, you can come to, because you're gonna be the witness, same with you Mal, you can watch over Cyn and make sure she doesn't escape. Brian, how would you like to be Cyn's matron of honor?" With that, the whole room, except for Brian, started to laugh. Brian, embarrassed, told them "No, you go ahead, I'll stay here and look after things." "All right, fine, have it your way," John told him, the gang grabbed their coats and headed out to New Jersey, where, they heard was a great place to get married, there and Las Vegas, but that's too far! On the way to New Jersey, the wedding party found a little dress shop opened late and Cynthia came in and picked a pretty white dress, the skirt came up just above her knees. She also found matching white high-heels to go with her dress. She was all set! She asked the owner if she could change her clothes here and was granted permission after she purchased. After she changed, she ran to the waiting car along with her clothes that she had on and threw them in the trunk, and then joined in on the festivities in the back. Julian sat on John's lap and was falling asleep, he had a tiring day and slept through the crazy emotion that went on in that car. When they got to New Jersey, Neil pull over at the first gas station that he saw to get out and look at the phone directory to find any late-night open chapels. He found one very close by and went back on the driver's seat and headed off. Not bad for an Englishman who's driving for the first time in America! His direction is too good and the boys and Cynthia consider themselves lucky to have Neil around. After an hour of searching for this late-night chapel, they finally arrived. John gave the sleeping Julian to George and took the hold of Cynthia's hand. They all went in and inform the receptionist that they are here to get married. Luckily, there was no late bookings, so the minister got on it quickly. Cynthia had no bouquet of flowers, so the receptionist gave her dried roses to use. After a few minutes, the party settled in their place; John and Cynthia stood in front of the minister, Paul stood at John's side. Mal, sleeping Julian, George, and Ringo sat on the chairs that were provided for them. They were ready to begin. Five minutes later, the minister pronounced John and Cynthia husband and wife. After signing their marriage certificate and paying for their fee, the happily married couple, their sleeping son, and the rest of the party left back to New York, in time for the Beatles to start their official tour, performing on 'The Ed Sullivan Show', and Cynthia's packing up her hotel room to move to John's, and to call her mother with the news. Her mother wasn't pleased, but followed her daughter's wishes to pack up her belongings and to send them to Phyl, who will oversee the move to John's apartment in London.